A sign guides voters into a polling place at Fireman’s Pump House during the first day of early voting on Monday in McAllen. Some early voting locations close as early as 5 p.m. on Friday, the last day to vote early. Hidalgo County’s 32 early voting polling locations open at 7 a.m. Residents in line by 7 p.m. will be allowed to vote. 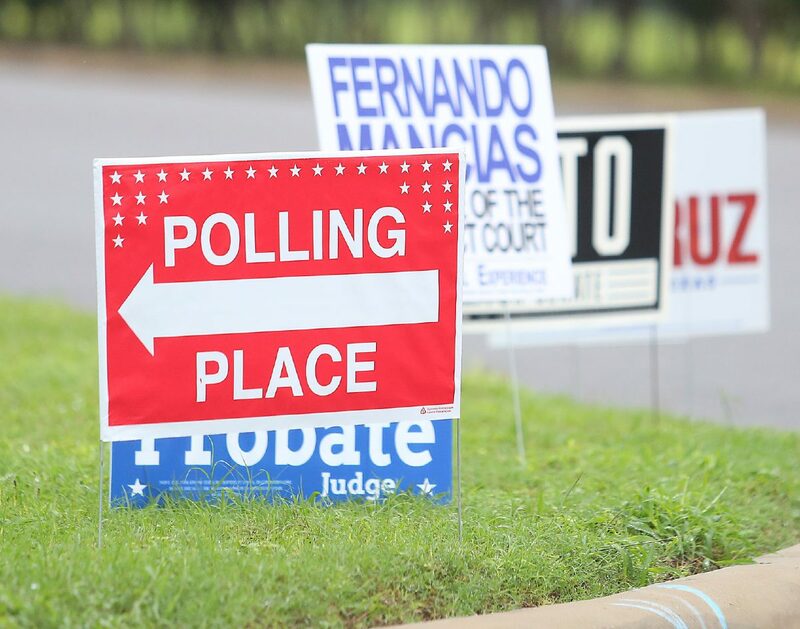 On Friday, the county’s two mobile voting locations will be stationed at the Hidalgo County administration building on 2800 S. Business Highway 281 in Edinburg and at IBC Bank on 1 S. Broadway St. in McAllen. The two locations open at 7 a.m. and close at 5:30 and 5 p.m., respectively. In Starr County, four early voting polling locations are open from 8 a.m. until 5 p.m.
As of Wednesday, 92,537 Hidalgo County residents, about 25 percent of registered voters, cast ballots in person and by mail. Hidalgo County residents may also cast ballots at any of 74 polling location on Tuesday — Election Day.